While in port in Santorini, take a private shore excursion to explore the active volcano of Thira. Enjoy a boat trip to the volcano and soak up the stunning natural scenery as you walk around the crater and learn about past eruptions from your private guide. Youll also relax in some natural hot springs, and enjoy port pickup and drop-off. When your cruise ship docks at the Santorini port, youll be picked up by your guide for a boat trip to the active volcano of Thira. Follow your guide on a moderate walk to the top of the island and learn about the volcanos 3,000-year history. Hear about its last eruption in 1950 and discover the little-known fact that the archipelago of Santorini is the remnant of a volcanic caldera, meaning it was formed after an enormous volcanic explosion destroyed the formerly single islands earliest settlements. As you walk, your guide will point out pieces of magma and fumes emitting from the crater. At the end of you tour, youll be taken back to the Santorini port. 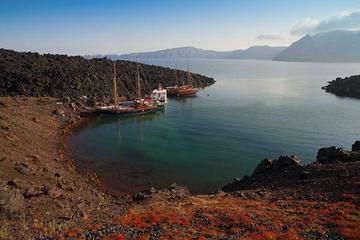 We will ensure your excursion ends with ample time for you to return to the Santorini port for your ships departure. In the extremely unlikely event your ship has departed, we will arrange for transportation to the next port-of-call. If your ship is delayed and you are unable to attend this activity, your money will be refunded. See our terms and conditions for full details.